From the Hancock County Courthouse, go southwest on Hwy 22 for 7.2 miles to the intersection of Hwy 22 and Main Street in Devereux. Turn right on Main Street and go 0.2 mile to Church Street on the left. Turn left and follow Church Street for 0.3 mile until it merges into Devereux Rd. Go left on Devereux Road and follow it for 2.9 miles to Island Creek Church Road (dirt) on the right. Turn right onto Island Creek Church Road and follow it for 3.0 miles. 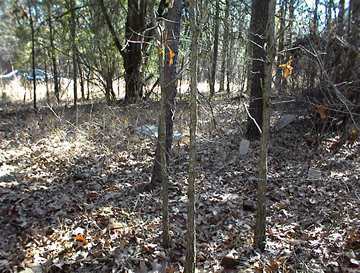 The cemetery is on the right off of the road slightly and under some large, old cedars. 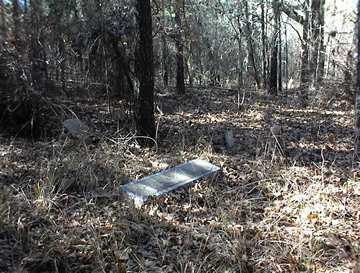 The cemetery is also 1.0 mile from the corner of the T intersection of Island Creek Rd and Island Creek Church Rd. All info per Kimbrough. Grave not found in 2002. Approximately 17 graves marked by bricks or depressions.